Meet the “Rubbin Off The Paint” star from Birmingham, Alabama. This September, YBN Nahmir shared “Rubbin Off The Paint,” his breakout hit, via Worldstar. The song’s a cheery bop with a SpongeBob-type beat, laced with matter-of-fact, Bay-area-inflected bars about keeping opps at bay and getting money, with Mozzy and Rick and Morty namedrops sprinkled in between. The video for the track, in which Nahmir sports a pink MCM backpack and is surrounded by friends and cousins — some of whom are a part of his YBN crew — has amassed over 22 million views in just four weeks. This past weekend, Vince Staples jumped on the beat, releasing a “Rubbin Off The Paint” freestyle of his own. 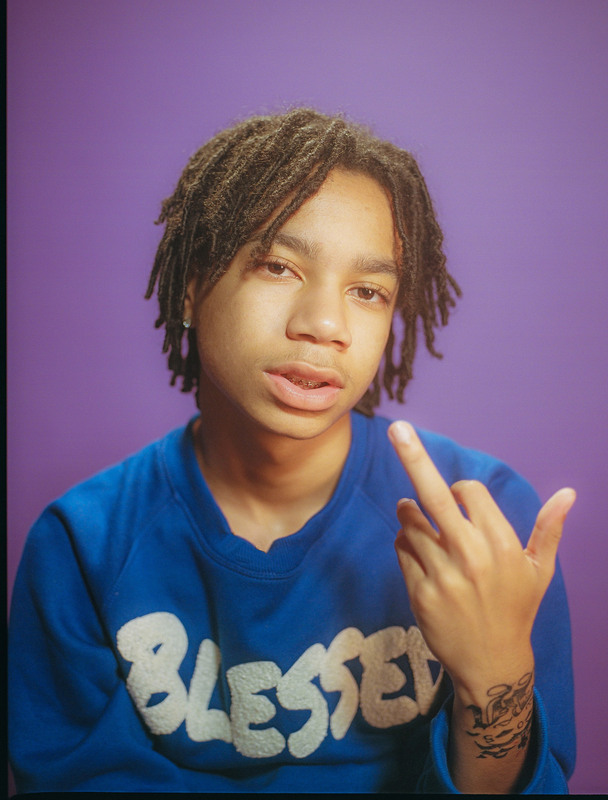 Even before “Rubbin Off The Paint,” Nahmir had already gathered somewhat of a following — but in the gaming world. The 17-year-old Birmingham, Alabama rapper, born Nick Simmons, spent most of his early teen years hanging out on XBOX Live, gaming with and befriending young kids from the west coast. They would record and share their own Grand Theft Auto V streams, turning them into mini-shows on YouTube. Gaining popularity within the XBOX community for performing freestyles during Live sessions, he began to record and post songs of his own to his YouTube channel for fun. 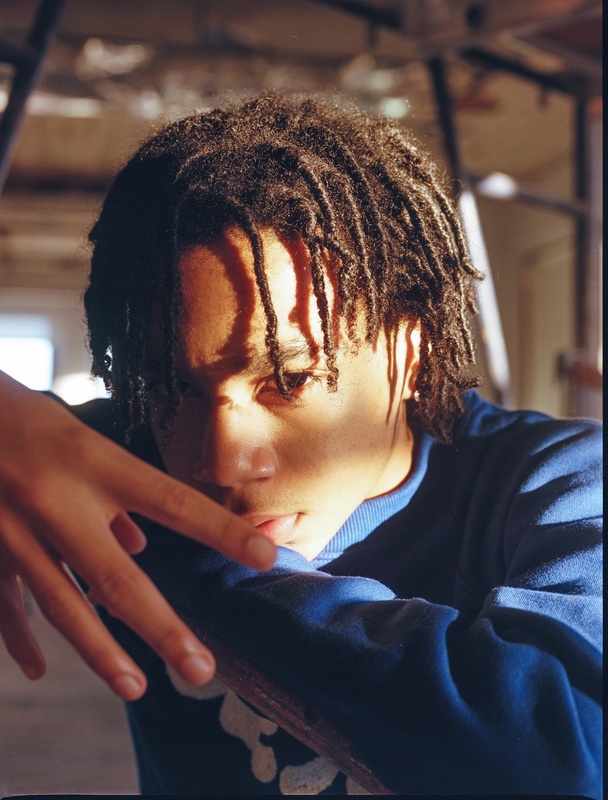 While on a recent meeting-filled trip to New York, Nahmir stopped by The FADER offices to talk about his love for the Bay Area, his gamer past, how he’s handling senior year, and what’s up next. Birmingham, Alabama. I still stay at home. I'm finna move though, I gotta move soon. It's hot. I live with my mom and my cousins, and my aunty. I've always lived in Alabama. Some of the artists that you shout out are from the Bay Area, and sometimes your flows sound like they’re Bay-influenced. What’s your connection to that part of California? I'm tapped in with everybody from the Bay, Mozzy, all of them. I used to be on the internet a lot, so all my friends on the internet were from California. I was always around them [online], so I started to sound like them. I think that's really why. Most of my friends that live in Birmingham, some of them are from Vallejo. I don't really hang around people from Alabama for real, except for my cousins and them. I guess that's what makes the big impact. You said you were on the internet a lot. Doing what? Playing games. I always had a big fan base on the internet, but it wasn't as a rapper. It was just as, “Nahmir.” I used to be on some nerd-type stuff. I wasn't rapping on the internet all the time. I used to do GTA videos, I used to do everything. 12 or 13. This was XBOX 360, when everybody started getting their [own consoles] on Christmas. I was so young, and everybody wanted to be around me because I was different. I didn't act like nobody, I didn't want to be like nobody — everybody tried to be like me. I wasn't no follower, either. So did gaming lead you to rap? Or were you always into music? I was into music before the games. I was always doing music. I've been playing [XBOX] since I was young, but I wasn't really on the game rapping like that. A few years ago I started rapping on the [Live], I was getting clout off of that. And then I started taking it for real. I guess you could say the game was an impact, lowkey, because I gained a big fan base off of rapping on the game, too. I was freestyling most of the time, and I think they just messed with it because I was so young and going so crazy. Me and my homeboy Almighty Jay — he YBN too — we used to just be freestyling in XBOX parties. They used to look up to us, even though we were so young. It was just a hobby, something I did when I was bored. I recently started taking it serious because of "Rubbin Off The Paint." I always tried to take it serious, but it was like a It ain't finna get me nowhere-type of mindset. But then, soon as "Rubbin Off The Paint" was finna do numbers, I was like, Yeah, we're gonna get on this music stuff for real. You say you want to be outside of the box. Are there artists that you look up to that are like that? Mozzy, Yatta, Lil Yase — he don't rap like nobody. Mostly, it's a bunch of Bay area people and people from California and Sacramento that got their own type of style. They don't try to be like nobody else. They got their own type of swag. It's different, and it's poppin' right now, too. I'm not trying to say that I'm doing it for no fame. That's the people I be around, so of course that's the mindset that I'm living in. That's how I sound, it stuck and I can't change it. Key Glock got his own type of swag, too, him and [Young] Dolph. But everybody else, to me they just sound the same. I get tired of that sound. I can't listen to them. It's like everybody try to sound the same exact way because they think it's going to get them some fame, but nah. You've got to be different. How did you link with Key Glock? He's from Memphis. I had a show in Tuscaloosa. I was opening up for him. I didn't know him before that, but I knew of him. He was bro. After that show, I was like, "I'm finna send you a song." He was like, "Alright." He hopped on it, and we're finna shoot the music video. That's bro for real. He told me to stay out the way, to stay out of trouble and all that. He's like a big brother figure. You're still in school right? What's it been like since "Rubbin Off The Paint" started popping off? I'm still in school. I've got online classes, though. I just started them two weeks ago. I couldn't really do [school]. I was skipping school because it was too hot. I couldn't even concentrate on my work. People always sitting by my desk, "Aye bruh! You know you on Worldstar?" Of course I know I'm on Worldstar, what you mean? It's Worldstar! People just bugging me 24/7, I couldn't do nothing. It was too many fans. Even my friends turned into fans, I was like, Damn. It's not no hate or nothin', but people start begging for stuff, like they automatically thought I was rich or something. I can't give you the world, if I'm not put on. I can't help you out if I can't help myself out. Everybody was just relying on me, and I couldn't even rely on myself because I wasn't getting paid for nothing. This is my last year [of school] though, and I can still go to prom and all of that, so you know I'm going crazy. I'm pulling up in Lambos and all of that. How have you been recording music? What's your setup like? At home. A Blue Snowball mic, and Mixcraft 8, and my own settings. Just in the room, with a sock over my mic, because I ain't have no filter. How did you link with your producers or find beats early on? Some were from the gaming community, that I already know. Some were just YouTube beats that were free, so I used them, but now I've gotta pay for them. I thought they were free because they said "free" online, but you still gotta pay for the exclusive, and I didn't know that. Now I have my own producer, he makes my own beats. My homeboy Hoodzone, he's in YBN too. You're pretty young, and things seem to be going pretty quickly for you. How do you feel? It's cool. I'm trying not to get too big-headed. I've got to always still look over my shoulder because I'm from Birmingham. It's a lot of hate in my city. I gotta watch who I'm hanging with. I can't trust nobody, for real, for real. I know I can trust a few people, but still, there's that feeling that you have to watch your back from everybody. You can't slip up. Because in a second it can all be taken away. I don't want anything to happen. That's why I'm trying to stay low-key and stay out the streets, to be honest with you. Is your mom supportive? Is she excited for you? Yeah, she's excited, but she's too protective. Now that it's popping for real, she tries to keep me in the house 24/7. I want to be in the house sometimes, I understand it's hot outside, it's hot where I'm from, but still, I'm a teen — what you expect me to do? II still got friends, I still gotta go to the store. I still wanna go to the mall. A lot of young artists, are trying to figure out whether they want to stay independent and build themselves on their own, or if they want to sign to labels. How do you feel? I'm not really looking to sign to a label right now. There are labels hitting me up, I'm going to meetings with labels, but I want to start my own stuff. YBN — I want that to be my own, I don't want to be under nobody. If I gotta be under somebody to let YBN be my own stuff, then it gotta happen, but it gotta be the right price, too. I don't want to be under somebody just 'cause they see me as a dollar sign. I'm still thinking about everything, because it's coming so fast, and I don't want to just pick something that's going to change my whole life, and I'm going to be fucked up and can't do nothing about it. Where do you see all of this going? What's your ultimate goal? My ultimate goal? To move my momma out of Birmingham. To move my whole family out of Birmingham, my friends, my family, me. It don't even need to be out of Birmingham, just to a better community, a gated community or something. Because around my way it's too hot. My cousin just got out of jail. I care about the music stuff, but I just want to get the money right now to get my family out the way. That's the main goal.